Witch shoes! Yay! There are two things that make me most happy during the month of October: Glitter and Halloween. 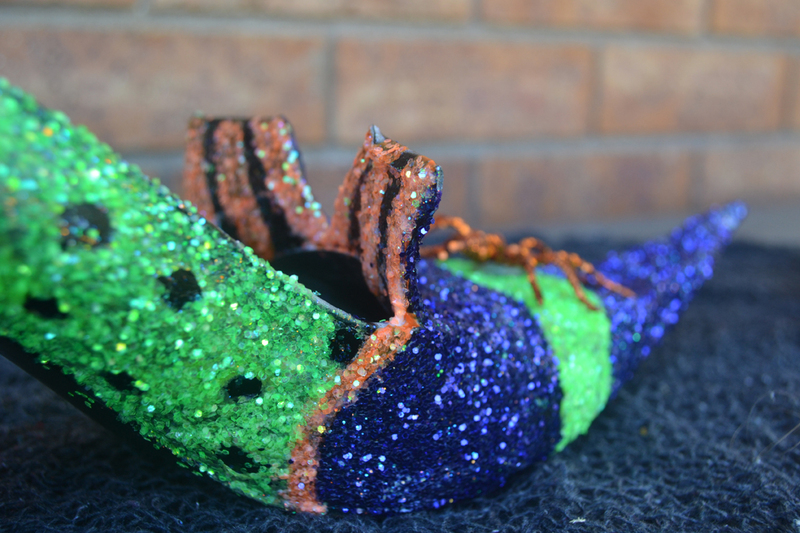 So, I’ve combined both to make these wickedly cute witch shoes to add to your Halloween Decoration. They will have your friends and family freaking out. They are so cute! Plus, I was pleasantly surprised that they were easier than I thought, they just take a little bit of time and patience. So let’s get started. 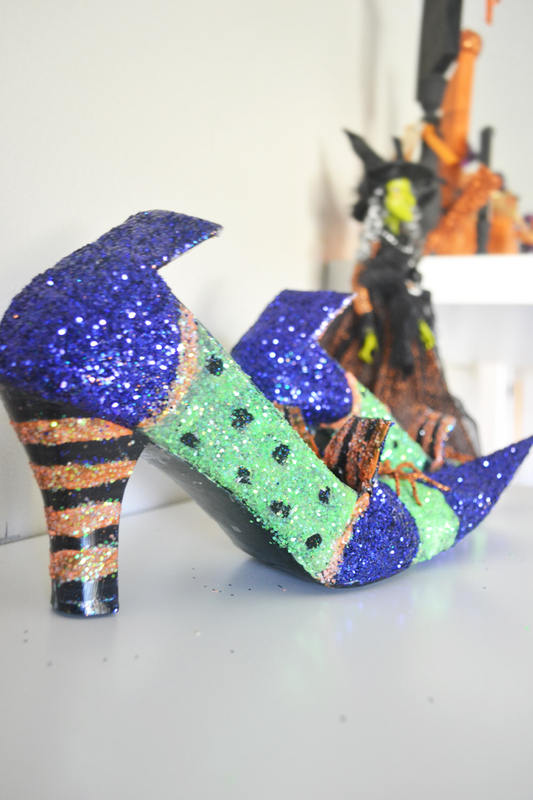 My new witch shoes as decorations in my home. First you need to find an old pair of pumps that you don’t want anymore. Or try snatching up a pair from the second-hand store or a garage sale. They don’t have to be black, but try to find some with a darker color. 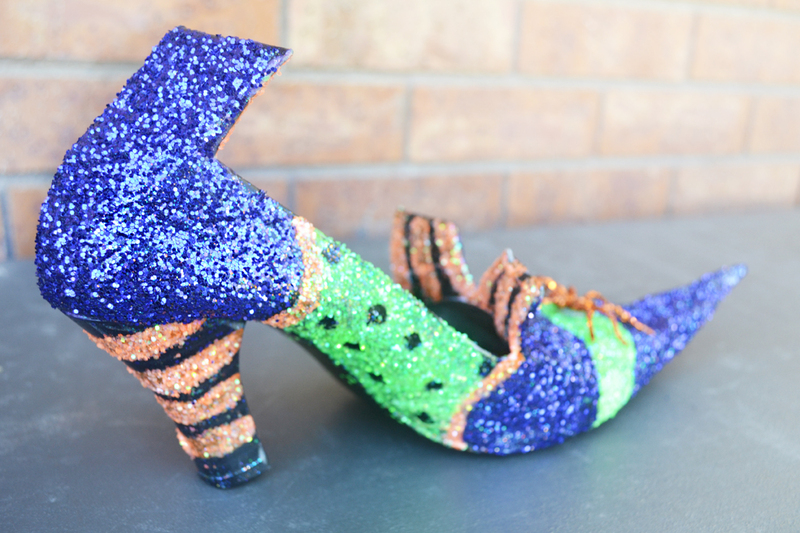 Sweetcdesigns (where I originally got this fabulous idea) made these shoes using brown pumps. They worked great too. 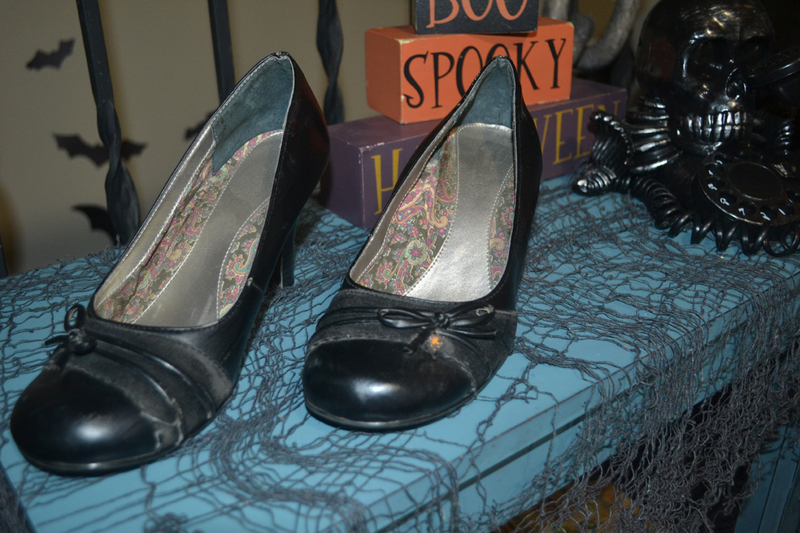 An old pair of black pumps that I used to make my witches shoes. For each shoe, I cut out three long and skinny triangles, a piece that looks like bunny ears and a triangle-type shape. Basically, you can cut out the shapes however you want. It depends on what you’re going for. Just be creative. 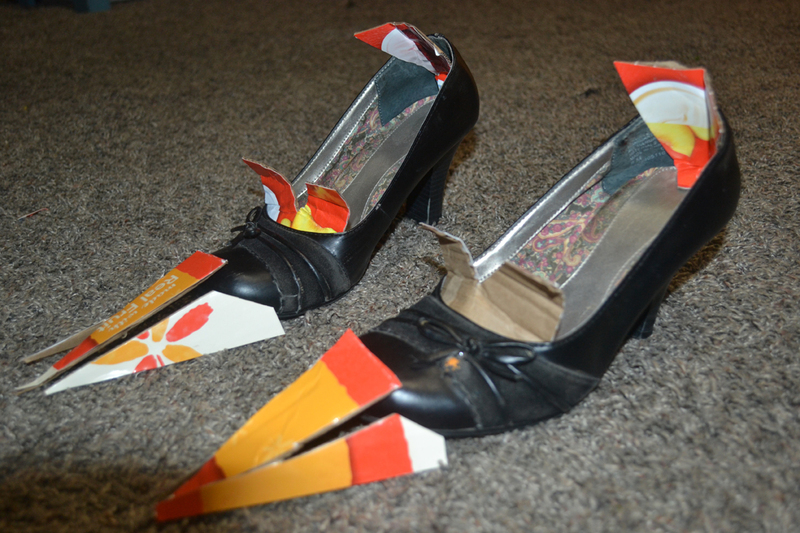 Then I placed each piece of cardboard in their appropriate place on the shoes. The shapes that I cut out to form the “witchiness” to my shoes. I used Gorilla duct tape because that seems to be the strongest. However, you can use painter’s tape or masking tape as well. I probably wouldn’t use Scotch tape though. Start with a long piece of tape and drape it across the toe of the shoe. Then keep adding tape. You can form the cardboard as you go. My witch shoes duct taped and ready to be painted. Using a foam brush or regular paint brush, spread on a thick coat of Mod Podge. 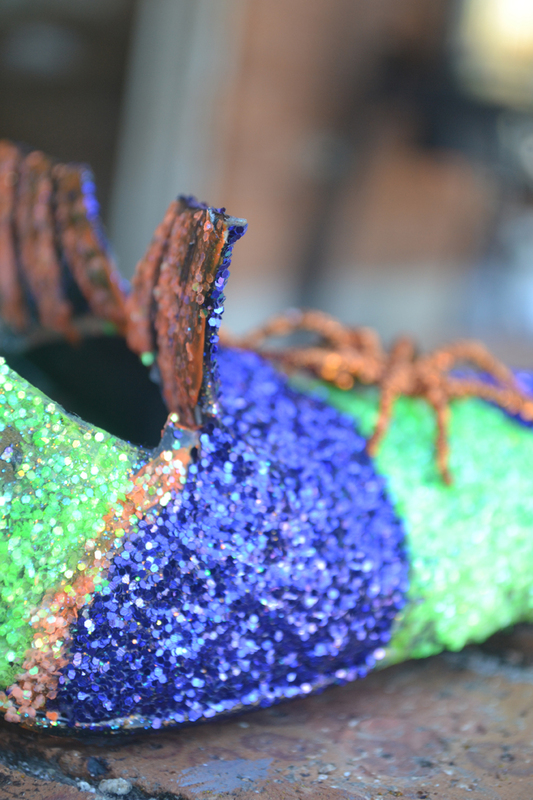 You’ll want to use Mod Podge with a glossy finish because you’ll be putting another layer on top of the glitter. If you use the matte it won’t be as sparkly! 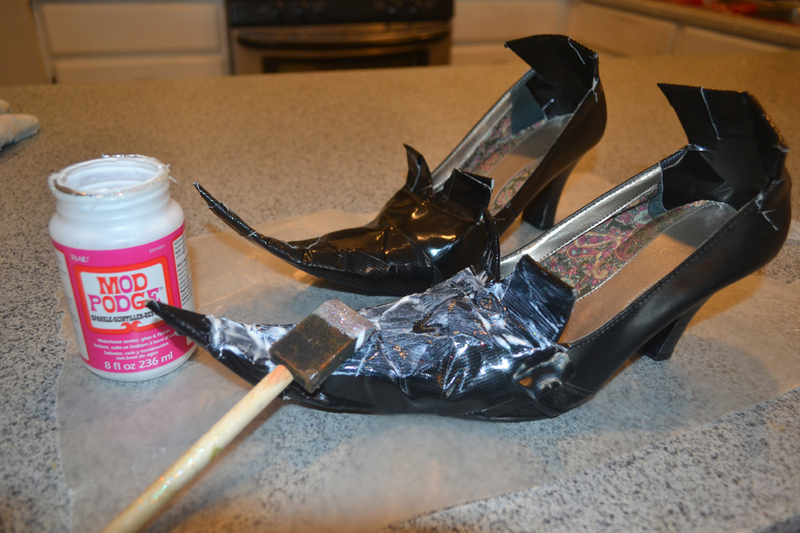 Once you’ve spread it on the shoes, allow 20-30 minutes for the glue to dry. Mod Podge being spread onto my witch shoes. Now your shoes are ready to be painted. But before you dive in, I would recommend drawing out what you want your shoes to look like. I had a lot of design elements that I didn’t want to mess it up. Then start painting. I wanted some dots on the side, so I used a hole punch to make some circles out of some self-adhesive white labels. I stuck them on while I painted and then pulled them off at the end. My drawing of my witch shoes (left). My painted witch shoes (right). Now for the fun part. 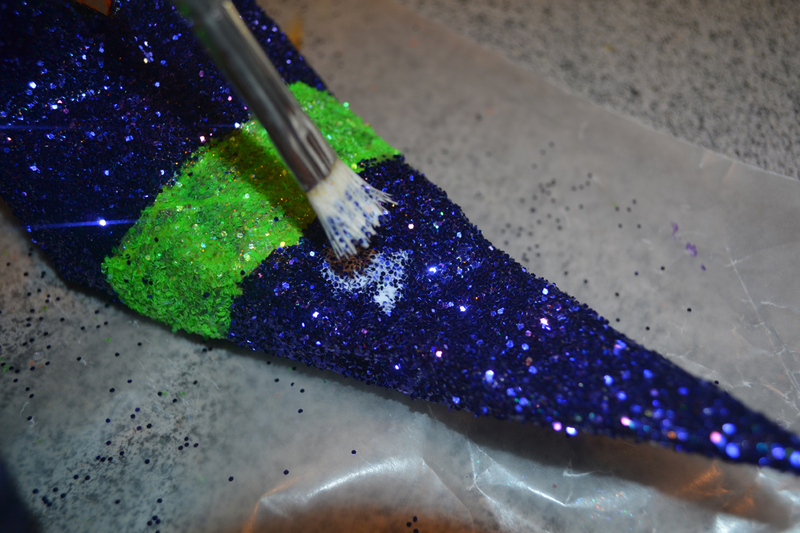 Starting with one color at a time, spread another coat of Mod Podge and immediately sprinkle your shoes with the individual glitter colors. Glitter can be really messy, so make sure you do it over a bowl. Use the glitter generously and then wait for it to dry. My shoes with glitter all over them! You’re almost done! This last step is crucial. 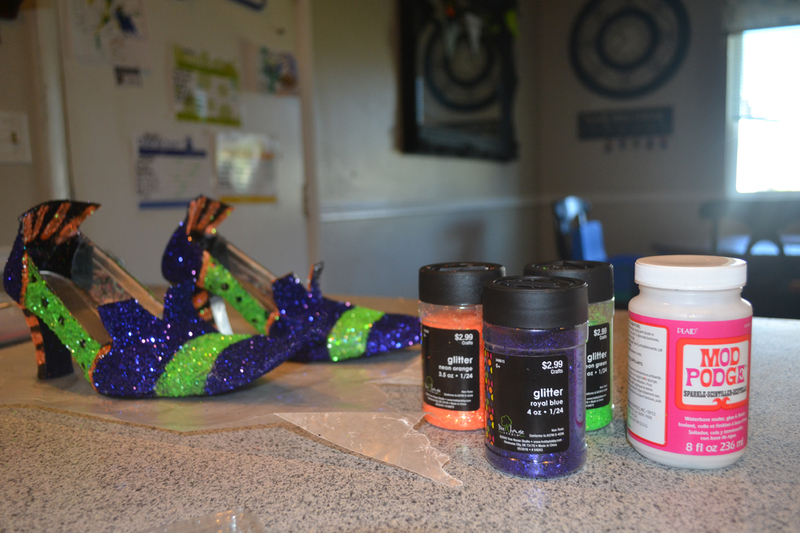 You will need to seal the glitter to your shoes. Otherwise, you’ll have glitter all over your house, although that may not be a bad thing :). To do this, take about a teaspoon of Mod Podge and about a 1/2 teaspoon of water and mix it together. Then blot the shoes with the glue one color at a time. Wait for it to dry and then you’re done! For added fun, you can hot glue a cute flower or spider to your shoes. 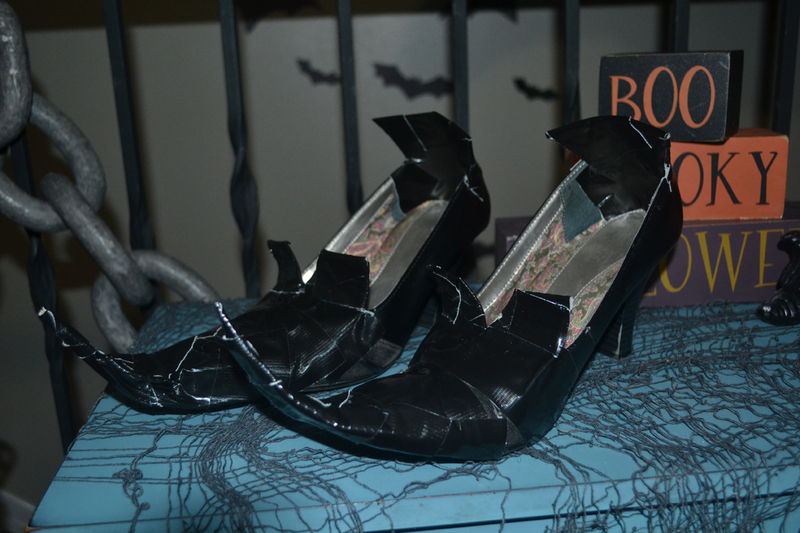 Mod Podge being blotted on to the witch shoe. Voila! You are done. 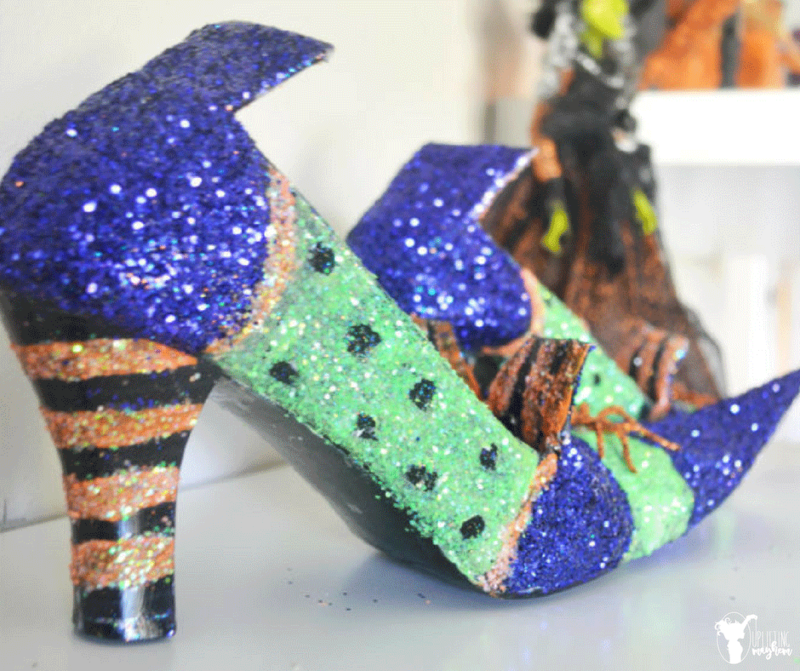 These shoes are awesome just by themselves as a decoration in your house or on a pair of stuffed witch tights. How did your shoes turn out? Leave your comments below. Easy Halloween Bat Decorations You Will LOVE! !